Easily Set Up A Real WordPress Blog By Following These Clear Step by Step Instructions...No Technical Skills Required...Guaranteed! After completing these clear step by step instructional films, you will have a professional quality blog, hosted and properly configured on a real domain name and be on the way to making money online in about an hour of actual effort. Discover that it really can be done...no technical skills required. Watch me go through the entire process in a little over an hour sharing tips and tricks from my technical experience as I go. I start from only an rough site concept, and go from brainstorming a domain name to posting my first article on a professional quality, secure and beautifully designed website. Entire Setup cost = ~$7.00 (includes the first 30 days of hosting). Earning potential = Much higher than on shared blogs like Blogger, Blogs or others. ProBlogger.net asks: What would you do differently if you had to start your blog over? Seth Godin: "...if I had to pick something, it would be directing to a domain I own (sethgodin.com) instead of sethgodin.typepad.com"
Kathy Sierra: "Use my own domain name instead of a typepad domain! If I’d had even the slightest clue my blog would ever end up with this much traffic, I would have been much smarter. It’s much too hard to change it now without completely messing with rankings, etc." Would you like to have a professional looking weblog ready for articles and configured for maximum effectiveness in about an hour's work? Here is what I cover, while recording it all. Lots of WordPress setup tips and tricks and from a professional IT guy. These steps were all recorded on my computer. Watch over my shoulder from start to finish and listen to my thoughts, including many technical and blogging tips learned from the trenches over the past two years I've spent as a computer geek and blogger. If for any reason you aren't completely satisfied with my step by step instructional films, simply ask for your money back within 8 weeks of your purchase. I guarantee 100% of your money back with no questions asked. It's that simple. "...ideal for beginner bloggers wanting to learn how to register a domain name, set up hosting and set up a WordPress blog on it. They are aimed at the very beginner and run through some of the technical aspects of setting up. The $39.95 cost of the videos is well worth it in my opinion." "Watching Jon set up and customize a Wordpress Blog step-by-step has been time well spent. Recommended." "If you are just starting in the blogging world and you want to run your blog independently and have a complete control over your data, you'd find Jon Symons' videos to be of a great value." "I just wanted to say thanks for having a great video to help me set up my blog. I did it in one day. Now, I'm ready for the next step, how to add adwords, etc. to make money with my blog too. Any suggestions? Are you going to have more how to videos? They were great." "Hello. Just wanted to say that your video on how to get a domain, set up a website, etc., is the most useful source I've ever used. If I had to make a suggestion, it would be that the information be delivered in a shorter period of time, but if a person is building a site for the first time, it may be about the right speed. Thanks for making the video!" The next step is yours. You know what you will receive. 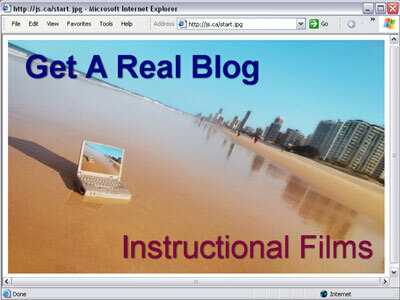 You understand there is an 8 week, no questions asked, money-back guarantee with the "Get a Real Blog Instructional Videos". So, there is no risk. The cost is only $39.95 for over 2 hours of tips and directions. Go ahead and click that order link below. Also includes our support email in case you have any questions or problems along the way. We're fully committed to helping you get your blog up and running. System Requirements: You will need Internet Explorer, and a way to listen to sound to watch the online video instruction series.